THE following pages have been published chiefly for those who take an interest in the locality of the ancient and now flourishing town of Arbroath, and also with the view of removing the obscurity which has hitherto involved the history of its once magnificent monastery. Among other sources of information the Chartulary of the Abbey is entitled to stand first in rank. The most interesting portions of these monastic writings have been digested and arranged in this volume. An endeavour has thus been made to bring out the points in which they, along with other authentic documents, tend to illustrate the history of the district. In alluding to the history of past times, our ancestors have been allowed as far as possible to appear in their own dress, and speak in their own words. This will account for the number of quotations in the antique style, which may probably render the perusal of some portions of the book a little difficult to readers otherwise well educated. But if months or years are spent in the endeavour to acquire a knowledge of dead languages two or three thousand years old, some trouble ought to be taken with the view of being able to read with facility our own living mother tongue, in the garb which it wore two or three centuries ago, so that it may not be unintelligible unless expressed according to our present conventional orthography. Many details, which to general readers not acquainted with the locality may appear sufficiently minute, are inserted in the text, instead of being placed in foot-notes, as it was considered desirable to avoid that distraction of attention which numerous notes invariably occasion. For the same reason references to the pages of the Arbroath Chartulary have not been made, as these, if introduced, would have become innumerable and cumbersome. They would, at the same time, have been of no use to those who do not possess that collection of writings ; and those, on the other hand, who may wish to verify any statement founded on it, will be at once able to do so, by the names and dates referred to, with the help of the tables of contents and indices of the published Chartulary. It was omitted to be stated in the tenth chapter that the lands of Aldbar have been ranked among the possessions of the Abbey on the authority of an entry in the "Charge of the Temporalitie," 1592, which is not altogether conclusive in the absence of corroborative evidence; and that although Cotside and others near Barry have been generally ranked among the Abbey lands, the authority for placing these lands in the catalogue is not very satisfactory, as they do not appear in the proper monastic writings under their modern names. While these sheets were in course of preparation the Author made every effort to procure definite information on the subject of the alleged pillage and conflagration of the Abbey Church about the time of the Reformation. He has not, however, succeeded in being able to fix the exact manner in which that building was unroofed and laid desolate. But a careful study of every contemporary record within his reach has tended to confirm him as to the correctness of the statements made in the text, that whatever might have been threatened or attempted, no general pillage or burning of this majestic edifice had taken place at the period in question; and that its state of ruin can be easily accounted for on other grounds, by a simple reference to the churches of the Abbeys of St Andrews, Lindores, Coupar-Angus, and others, where the demolition is much more complete than at the Church of Arbroath, and where the agency of fire has never been stated to have been applied. It need scarcely be explained that the notices of the town of Arbroath have been in general limited to the period when the monastic establishment existed in its neighbourhood. The history of Arbroath during the last hundred and fifty years, including the extension of its population, buildings, manufactures, and commerce, within that period, could not have been added without swelling the volume far beyond the limits originally contemplated; and is a subject which, along with the traditionary history of the burgh and its vicinity, yet remains to be taken up by one who can devote to it the necessary amount of time and research. The Author does not flatter himself that what is now given to the public can escape what every book of the kind is peculiarly liable to, namely, the detection of errors and omissions. He has endeavoured, however, to make no definite statement, unless upon good authority: without being deterred from offering this contribution to the history of the district by that over-scrupulous dread of mistake which has prevented many persons well read in the affairs of Scotland from giving to the world the benefit of their researches. There could not be found a more striking instance of this than in the case of the late Reverend Principal Lee, who has allowed much of his vast stores of information to die with him; and who, under the influence of this sensitiveness, most kindly dissuaded the author several years ago from engaging in an undertaking of a nature somewhat antiquarian, by referring to another friend who had devoted much time and labour to the early history of a northern county, which, when published, "after all contained some mistakes, and there were several things omitted." In the preface of a book devoted to the detail of facts regarding Arbroath, an allusion to a work of fiction supposed to bear reference to the same place may be allowed. An attentive reader of Scott's inimitable novel, "The Antiquary," acquainted with the vicinity of Arbroath, will have little doubt that it contains the scenery of that story. The allusions to the battery, the common, the Grecian porch of the new Council-house, the great interest taken in merchandise and linen manufactures, and the doings of the postmistress, are, among other marks, quite sufficient to identify the town of Arbroath forty or fifty years ago with the Fairport of the novel. Auchmithie and Ethie-haven are described with Scott's usual power in his pictures of the fishing hamlets, and contain fisherwomen who might sit any day as the originals of Maggie MIucklebackit. Ethie Rouse is the only mansion in the neighbourhood that suits the description of Knockwinnock. But the claims of identity with Monkbarns are divided betwixt Seaton and Anniston, while the description does not exactly suit either. The high rocky coast between Arbroath Ness and Redhead will supply Halketheads and Bally-burgh Ness Points in abundance. A poet's license is taken in placing "the root o' an aik tree" among the cliffs, and in making the sun set over the waves of the German Ocean during the storm ; and also in removing the ruins of St Ruth (described as Arbroath and Melrose Abbeys intermixed) from the bustling vicinity of a large town into one of the dells of the district, such as the den of Arbirlot. These liberties were obviously used for greater effect, and probably to involve the narrative in some degree of disguise. The veil becomes, however, very transparent when the writer makes Edie Ochiltree meditate on his appearance in the eyes of the villagers while he was "coming down the edge of Kinblythemont"—a phrase which will suggest to every inhabitant of the neighbourhood the bluegown's return toward Arbroath, along the old Brechin road leading by Chapelton and the policies of Kinblethmont. The Author takes this opportunity of returning his thanks to those gentlemen whose subscriptions have led to the present publication; and also to those who have facilitated his researches by affording information or access to original documents. 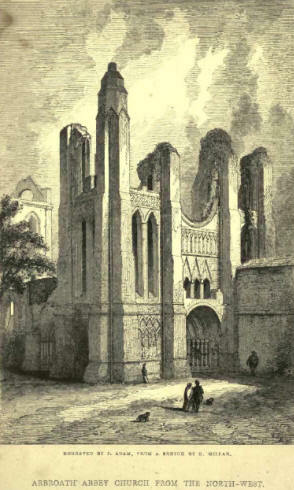 The frontispiece, engraved by Mr J. Adam, Edinburgh, a native of Arbroath, is from a drawing which the author made in order to shew the front of the Abbey Church as it now exists. and would appear to passengers were the view not obstructed by modern buildings which have been erected within a yard or two of its walls. The Monastic Writings of Arbroath : Historical subjects on which they supply information: Introduction of surnames: Topographical naives, and variations, changes and translations of same : Anglo-Norman and other settlers in Angus: Royal residences from 1178 to 1249: Introduction of Shires and Sheriffs: Formation of Parishes: Adoption of Tutelar Saints : Nature of Abthaneries: The Culdees and their Abbes: Culdees of Abernethy and Brechin: Causes of the fall of their order: Indications of Culdees at Monifieth and Arbirlot. 1. Origin and Condition till the foundation of the Abbey. 2. The Harbour. 3. Formation of Older portion of the Burgh. 4. Formation of Newer portion of the Burgh in the Almory. 5. Local Terms in the Town and neighbourhood. Arbroath at first a Burgh of Barony and Regality: Made a Free Burgh by special grants: Temporarily represented in Parliament A.D. 1579: Made a proper Royal Burgh in 1599. Condition of Rural and Urban Population at the time of the foundation of Arbroath Abbey: Slavery of the Rural Population: Power of the Barons: Burghs as Fountains of Liberty and Progress: Emblems of Burghal Freedom in Arbroath and other Burghs: Early state of Urban Inhabitants. Depression of Scotland in the Fifteenth Century: Civil broils: Chamberlain Aires: Subjects of Investigation: Condition of Craftsmen: Arbroath at the Reformation, and after its Erection into a Royal Burgh. Date of commencement: Mixture of Norman and Early English Architecture: Stages in the progress of building: Succeeding styles of Architecture shewn in the buildings. We've ocr'd the Preface, Contents and Chapter 1 for you to read here. The whole book can be downloaded here in pdf format. MY reason for writing the following pages is to be found in the conviction that a better acquaintance with the history of the burgh of Arbroath was an object at once desirable and attainable. 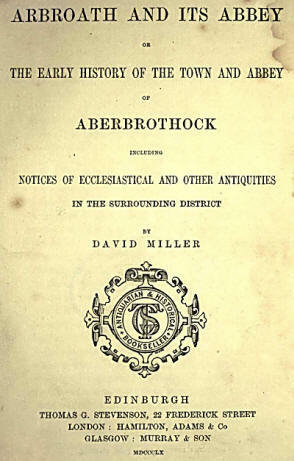 The Chartulary of the Abbey, published by the Bannatyne Club, is a mine of information with regard to the Monastery; and Mr Miller, in his book on ‘Arbroath and its Abbey' has brought much of this information before a popular body of readers. But still little was known of Arbroath history except that which belonged to the times of the Abbey; as to more recent history, almost the only fact which stood out with any prominence from amidst dim tradition was the bombardment of the town by a French cruiser in the year 1781. Notwithstanding the defective condition of the early records of the burgh, there were grounds for believing that material might yet be found from which something like a connected history of the town could be built up, and I some years ago began an investigation with that object in view. The Chartulary of Arbroath Abbey, and other works tending to illustrate the history of that great religious establishment, were examined. I then made an examination of the early Court-Books of the burgh; and fortunately, while I was so engaged, there were found some leaves of a burgh record which had been kept in the first half of the sixteenth century, and which afford glimpses into the civil and ecclesiastical condition of the town in that hitherto rather dark period of its history. The whole of the minutes of the Town Council, extending from February 1727 to the present time, have also been gone over by me. I have likewise made an investigation of the records of the Arbroath Guildry Incorporation, of the Seven Incorporated Trades of the town, and of the ecclesiastical records of the district, these consisting of the registers of the Presbytery of Arbroath and the Kirk-Sessions of Arbroath and St Yigeans. The fruit of these investigations, long continued, and of a somewhat laborious character, is contained in the pages which follow, in the preparation of which I have also availed myself of any other sources of information with regard to local history which came in my way. Speaking only of the material of this History, and not of course regarding the quality of the workmanship displayed in the putting of it together, I may venture to say that some of that larger portion of it which has been got at by researches into hitherto unpublished records, is of value not merely from a local point of view, but as being illustrative of civil and ecclesiastical affairs at critical periods of the history of the nation. With respect to the plan of the work, it was evident that to follow, as in more general histories, a strictly chronological ~ order, would result in a mere disjointed chronicle of events. The work has accordingly been divided into Parts, in each of which one subject or department of local history is taken up and exhausted. In the matters treated of in the several Parts, as well as in the order in which the Parts are given, the historical sequence has been observed. Among other advantages, it is believed that the arrangement adopted will facilitate reference to the book, for which purpose also an Index has been appended. With regard to the pictorial illustrations, more of them might have been introduced but for the consideration that the consequently enhanced price of the book might have placed it beyond the reach of a large portion of the public. Still it has been attempted to make the illustrations as complete as was possible in the circumstances. The four pages of those of the Sculptured Stones of St Vigeans which were discovered when the Parish Church was restored in the year 1871, have been printed here by arrangement with the Society of Antiquaries of Scotland, in the ninth volume of whose 1Proceedings’ they have already been published. The Drosten Cross, which is figured in the late Mr Chalmers’ 'Ancient Monuments of the County of Angus' and in Dr Stuart’s 'Sculptured Stones of Scotland,’ is given for the first time in a form as complete as is now possible. The fragment, measuring 25 by 21 inches, which was found in 1871 has been placed in its proper relation to the rest of the Cross, and a representation of the whole is now given from a photograph by Mr Milne, Arbroath, who also photographed the other sculptured stones of St Vigeans. I am indebted to Mr Miller for his sketch of the Abbey Church from the north-west. The sketch was engraved by Mr John Adam, of Edinburgh, a native of Arbroath, who has attained to distinction in his art. The view does not show the front of the Abbey precisely as it is to be seen at present, but as it would be seen were the modem erections that are clustered about the ruins removed. The ruins of the Abbey are Crown property, and some years ago the Department of the Government which takes charge of them was memorialized to co-operate with the local authorities in getting that portion of the Church which extends northwards from the west gate opened up to view; but as yet this has not been done. The other page of views of the Abbey has been drawn from photographs by Mr Milne, as have also the views of Auchmithie and the Church of St Vigeans. The views of the Town and Harbour, and of the High Street, are from photographs by Mr Geddes, Arbroath. My thanks are due to those gentlemen for the use of their photographs. With the exception of the wood engraving of the Abbey, the full-page illustrations have been lithographed by Messrs George Waterston & Son, Edinburgh. The seal of the Corporation of Arbroath, printed on the title-page, and the view of the Bell Hock Lighthouse, on page 442, the latter reduced from a photograph by Mr Geddes, have been engraved for this volume by Mr Adam. The seal is a copy of the one now in use. Until about twenty-five years ago, when the helmed head was added, the Corporation seal consisted only of the portcullis. It now only remains to express thanks for assistance which I have received in the preparation and execution of this work. I am indebted to the members of the Municipality and the Town-Clerk; to the Guildry Incorporation and its Clerk; to the officials of the Incorporated Trades; to the Presbytery of Arbroath, and the Rev. James Hay, the Presbytery Clerk; and to the Kirk-Sessions of Arbroath and St Vigeans, for the readiness with which I obtained liberty to examine the records of those bodies, and for the facilities which were afforded me for that purpose. My thanks are likewise due to the Rev. Robert Grant, Clerk of the Presbytery of Brechin, for extracts from the register of the formerly united Presbyteries of Fordoun, Brechin, and Arbroath. I am indebted to the Curators of the Advocates’ Library, Edinburgh, for permission to consult their collection of manuscripts and printed books; and to T. Hill Jamieson, Esq., the Keeper of the Library, for many favours. I have also consulted books in the Signet library, Edinburgh, in the Public Libraries of Dundee and Arbroath, and in the Forfar Library; and in so doing have been favoured with the ready help of the officials. It is with deep sorrow for his recent lamented death that I mention here the name of the late Dr Forbes, Bishop of Brechin. Bishop Forbes communicated to me the interesting extracts from Theiner’s "Vetera Monumenta" occurring in Part II., and made suggestions of much value with regard to the earlier portions of the book generally. I shall always remember with gratitude the kindly interest which that eminent scholar took in the progress of this work, as well as the favourable opinion which he was pleased to express, in a letter to me written only a few weeks before his death, in reference to those parts of it which had come under his observation. I am indebted to John Stuart, Esq., LL.D., Edinburgh, author of ‘The Sculptured Stones of Scotland,’ and other most interesting and valuable works, for his kindness in directing me to some sources of information. I am further under obligation to the Rev. William Duke, F.S.A Scot., St Vigeans; Patrick Chalmers, Esq. of Aldbar (for a loan of ‘Miscellanea Aldbarensia’); Alexander Gardyne, Esq., London; Alexander Brown, Esq., LL.D., Arbroath; Mr Buncle (who has assisted me in the work of transcription), and other gentlemen. Ben. N. Peach, Esq., of H.M. Geological Survey of Scotland, favoured me, at my request, with a monograph on the geology of the district of Arbroath, an epitome of which is given in the first three pages of the last chapter of the book; and I am indebted to a friend, to whom I do not feel free to do more than allude, for the preparation of the Index and the revision of the proof-sheets. Acts and Records of the Seven Incorporated Trades of Arbroath. Acts and Records of the Guildry Incorporation of Arbroath. Arbroath Town Council Minutes, 1727 to the present time. Arbroath Burgh Register pf Sasines. Memoranda of the Abbey and Town of Arbroath. 23 pp. 1816. Mudie’s, D. (Town-Clerk), Account of Arbroath, 1742. Registers of the Presbytery of Arbroath, dates, 1659-1687; 1794 to the present time. 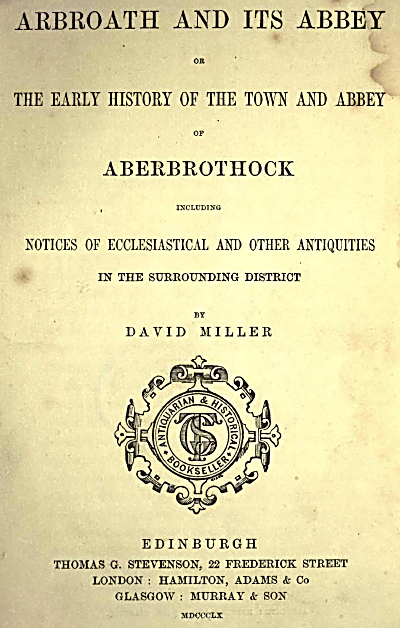 Register of the United Presbyteries of Forden, Brichen, and Aberbrothock. Register of the Kirk-Session of Arbroath, consulted from 1669 (with blanks) to a recent date. Register of the Kirk-Session of St Vigeans, consulted from 1665 to about the middle of the eighteenth century. Schedule of Land Customs of the Burgh, 1775. Acts of the General Assembly of the Church of Scotland. 1698-99. Acts of the Lords Auditors of Causes and Complaints. 1839. Acts of the Lords of Council in Civil Causes. 1839. Acts of the Parliaments of Scotland. 11 vols. 1814-44. Arbroath, list of Electors of, showing the Votes in 1833. Balfour's, A, Characters and Tales. Bannatyne Miscellany. (Bannatyne Club.) 3 vols. Edin. 1827-55. Black’s, D. D., History of Brechin. Edin. 1867. Boece’s, EL, History and Chronicles of Scotland. 2 vols. Edin. 1821. Bremner’s, D., Industries of Scotland. Edin. 1869. Buckle’s, H. T., History of Civilisation in England. 3d edit. Lond. 1860. Burke’s, Sir B., Peerage and Baronetage of the British Empire. Lond. 1860. Burnet’s History of his own Time. 2 vols. Lond. 1724-34. Burton’s History of Scotland. 2d edit. 8 vols. Edin. 1874. Calderwood’s History of the Kirk of Scotland. 7 vols. (Wodrow Society.) Edin. 1842-45. Chalmers’, P., Sculptured Monuments of Angus. Edin. 1848. Chambers’s, Dr R., History of the Rebellion of 1745-46. Edin. 1858. Charters and Documents relating to the Burgh of Peebles. (Scot. Burgh Records Soc.) Edin. 1872. Chronioon de Laneroost. (Bannatyne and Maitland Clubs.) Edin. 1838. Deer, The Book of. (Spalding Club.) Edin. 1869. Dempster’s, T., Historica Ecdesiastica Gentis Scotorum. 2 tom. (Bannatyne Chib.) Edin. 1829. Edward’s, R., Description of the County of Angus (1678). Dundee 1793. Forbes', Dr A. P. (Bishop of Brechin), Kalendars of Scottish Saints. Edin. 1872. Foxdun’s, J., Scotichronioon. 2 tom. Edin. 1759. Fraser’s, W., History of the Camegies, Earls of Southesk, and of their Kindred. 2 vols. 1867. Gordon’s, Dr, Catholic Church in Scotland. Aberdeen 1874. Grahame’s, C. Stirling, Mystifications. Edin. 1865. Hailes’, Lord, Annals of Scotland. S vols. Edin. 1797. Headrick’s, Rev. J., Agriculture of the County of Angus. Edin. 1813. Helyot’s Histoire des Ordres Monastiques. Paris 1718. Historical Manuscripts, First and Second Reports of the Royal Commission on. Lond. 1870-71. Holinshed’s, R., Soottish Chronicle. 2 vols. Arbroath 1805. Hook’s, Dean, lives of the Arohbishops of Canterbury. 2d vol. 1862. Hume’s, D., of Godscroft, History of the House of Douglas and Angus. 2 vols. Edin. 1743. Jervise’s, A., Land of the Lindsays. Edin. 1853. Memorials of Angus and Mearns. Edin. 1861. Epitaphs and Inscriptions. Edin. 1875. Johnson’s, Dr., Journey to the Western Islands. Edin. 1795. Keith’s Scottish Bishops, Spottiswoode’s Aocount of the Religious Houses in Scotland at end of. Edin. 1824. Knox’s, J., History of the Reformation in Scotland. 2 vols. (Wodrow Society.) Edin. 1846-48.
Letters from the Minister of St Vigeans to the Heritors, dates, 1823-28. life of John Metcalf. Knaresborough. Lindsay of Pitscottie’s History of Scotland. Edin. 1778. Lopes’, G. Domingo, Noticios Historicos de los Tres Florentissunas Provincias del Celeste Orden de la SS. Trinidad in Inglaterra, Escocia, y Hibernia. Madrid 1714. Lyndsay’s, Sir David, Poetical Works. 2 vols. Edin. 1871. Macaulay’s, Lord, History of England. 3d vol. Lond. 1855. Mackelvie’s, Dr W., Annals and Statistics of the United Presbyterian Church Edin. 1873. Mackenrie’s, Sir George, of Rosehaugh, Works. Edin. 1716. M'Crie’s, Dr, Life of Andrew Melvill. 2 vols. Edin. 1819. Maitland Miscellany. 4th vol. Glasgow 1847. Mealmaker's Moral and Political Catechism of Man. Edin. 1797. Melros', Thomas, Earl of, State Papers and Correspondence. (Abbotsford Club.) 2 vols. Edin. 1837. Miller’s, D. Arbroath and its Abbey. Edin. 1860. Miller’s, Hugh, Old Bed Sandstone. Edin. 1869. 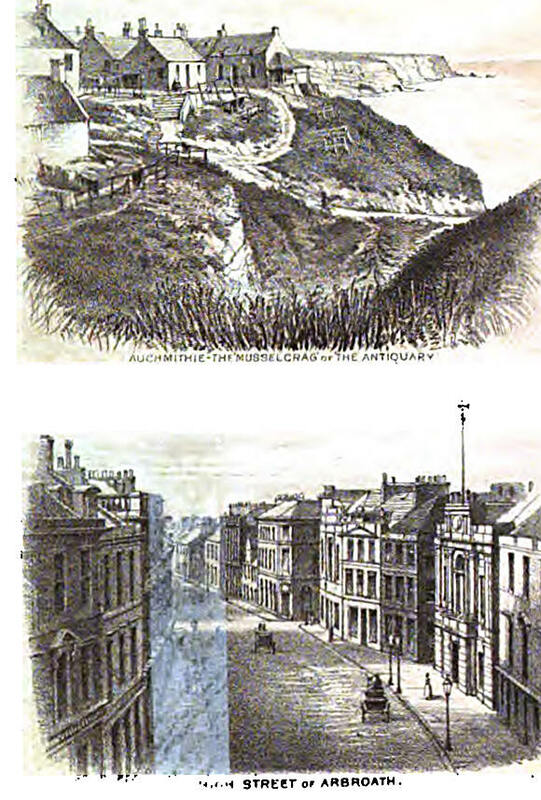 Municipal History of the Boyal Burgh of Dundee. Dundee 1873. Hobbie’b, W., Dundee Celebrities. Dundee 1873. Obdebicu8 Vitalis’ Ecclesiastical History of England and Normandy. 3 vols. Lond. 1854. Papers in Cases: Bakers' Incorporation v. Robert Lindsay of Almerieclose; Johnstone, Armstrong, A Co. v. Jolly and Sturrock, the Magistrates of Arbroath, and the Incorporated Trades ; William Ritchie the Magistrates. Pennant's Tour in Scotland. 3 vols. Lond. 1776. Person's, D., Varieties. Lond. 1635. Petrie’s, G., Round Towers of Ireland. Dublin 1845. Pitcairn's, R., Criminal Trials in Scotland. 3 vols. Edin. 1833. Proceedings of the Society of Antiquaries of Scotland. 4th, 9th, and 10th vols. 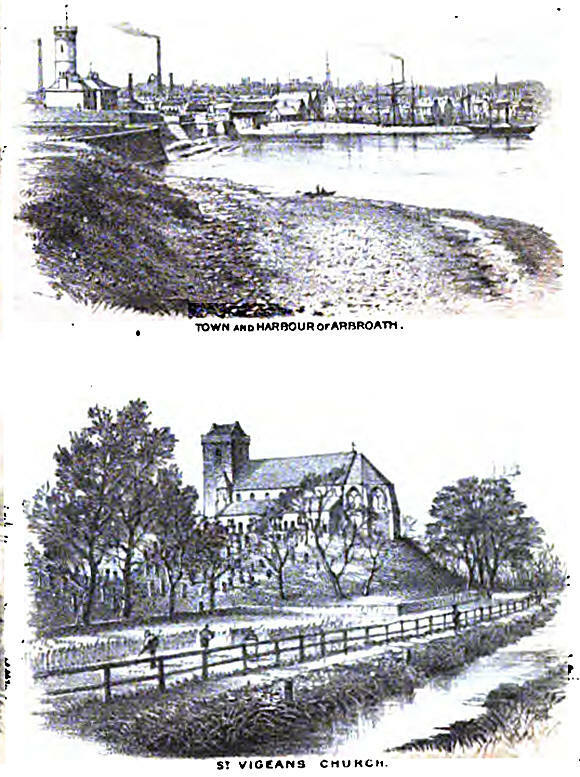 Proceedings in Arbroath for Obtaining a Reform of Parliament. Arbroath 1817. Records of the Convention of the Royal Burghs of Scotland. 2 vols. Edin. 1866-70. Registrum Episcopatus Brechinensis. 2 tom. (Bannatyne Club.) Aberdeen 1856. Registrum Episcopatus Moraviensis. (Bannatyne Club.) Edin. 1837. Registrum de Panmure. 2 vols. Edin. 1874. Registrum Prioratus S. Andree. (Bannatyne Club.) Edin. 1841. Registrum Vetus de Aberbrothoc. (Bannatyne Club.) Edin. 1848. Registrum Nigrum de Aberbrothoo. (Bannatyne Club.) Edin. 1856. Report by Committee of the House of Commons on the Royal Burghs of Scotland. 1793. Row’s, John, History of the Kirk of Scotland. (Wodrow Society.) Edin. 1842. Rymer’s, T., Foedera. 4 vols. 1816-30. Sadler's State Papers. 3 vols. Edin. 1809. Sands', J. Sim, Poems. Arbroath 1833. Scotland, Statistical Account of (Old). 7th and 12th vols. Edin. 1791-99. Scotland, New Statistical Account of,—Forfarshire. Edin. 1843. Scott’s, Dr Hugh, Fasti EcdesUe Scoticana. 3d vol. Edin. 1871. Sleser’s, Captain John, Theatrum Scotia. Lond. 1693 and Edin. 1874. Spalding's, John, Memorialls of the Trubles in Scotland and in England. (Spalding Club.) 2 vols. Aberdeen 1850-51. Spottiswoode Miscellany. (Spottiswoode Society.) Edin. 1844. Strachan’s, P., Map of the little World. Edin. 1693. Stuart's, Dr J., Sculptured Stones of Scotland. 2 vols. Edin. 1867. Thuher’s, Aug., Vetera Monumenta Hibemorum et Scotorum Historiam illustrantia. Roma 1864. Tytler’s, P. F., History of Scotland. 9 vols. Edin. 1828-40. Warden's, A. J., linen Trade. Lond. 1867. Wesley's, Rev. J., Journal. 4 vols. Lond. 1864. Works of Authors mentioned in Part VH. Chap. IV. Wyntoun’s Cronykil of Scotland. Edin. 1872. Page 42.—I am indebted to Alex. J. Warden, Esq., author of 1 The Linen Trade, Ancient and Modem,' and an interesting book on * The Burgh Laws of Dundee,’ for showing me a lease, in his possession, of the lands of Balfour, Kyrkton, Aacrawys (Upper and Lower), and the mill and mill lands of Kingoldrum, granted by the Convent of Arbroath on 20th February 1539-40, five years prior to the date of the Collision charter. The lease is signed by Cardinal Beaton, as Commendator of Arbroath, and twenty-four monks. In 'Epitaphs and Inscriptions’ (p. 385), recently published, Mr Jervise prints an abridgment of a charter of Balfour, granted on the same day as the lease just referred to, and to it also there are appended the signatures of the Cardinal and twenty-four other members of the Convent. This charter, which is at Panmure, is in favour of James Ogilvie of Cookstone, Marjorie Durie his spouse, and their heirs. The number of signatures to these documents bears out the view expressed in the text, that by the year 1544 the monastic brotherhood of Arbroath was much reduced in number, compared with what it had been less than thirty years before. Plage 202.—Dr Lumsden, Principal of the Free Church College, Aberdeen, died there on the 17th October 1875. Plage 257.- The Bev. John Macdonald resigned the pastorate of the congregation assembling in the Baptist Chapel, Arbroath, in September 1875. Page 813.—From the abstract of the Arbroath Guildry accounts to Michaelmas 1875, it appears that the nett stock belonging to the Incorporation eras at that date £2454, 13s. 2d. Page 828b—The revenue of the Harbour of Arbroath for the year ending 14th October 1875 was £4179, 18s. 7d., being £459, 18s. 6d. in excess of the expenditure. Page 396.—From the abstract state of the books of the burgh of Arbroath for the year ending 10th October 1875, it appears that the revenue eras £1578, 5s. 8JcL, which was £282, 2s. 3d. in excess of the expenditure. The nett balance of stock at the same date was £21,883, 5s. 4½d. Pages 12 and 13.—For Aitken read Aitkin. Pages 94 and 95.—For Ferguson read Fergusson. THE ABBEY, FROM ITS FOUNDATION IN 1178 TO THE DISSOLUTION OF THE ABBACY IN 1606, TOGETHER WITH THE SUBSEQUENT HISTORY OF THE MONASTIC BUILDINGS. HISTORY OF THE BURGH TO THE EIGHTEENTH CENTURY. HISTORY OF THE BURGH FROM 1727 TO THE PRESENT TIME. INSTITUTIONS AND SOCIETIES—TRADE-NAMES OF STREETS—LITERATURE, SCIENCE, AND ART—THE CLIFFS AND CAVES. This video is produced by the members of Arbroath Round Table. It was done as an entertainment piece for residents of Arbroath care and residential homes, to help those with dementia recall times gone by in the town they grew up in. The feedback on this video was so overwhelmingly positive that we were asked for copies, more than we can actually produce, so the easiest thing is for anyone to enjoy it and here it is on YouTube. With thanks to the Arbroath Herald for access to their picture archive and Anvil Ceilidh Band for public use of their music.